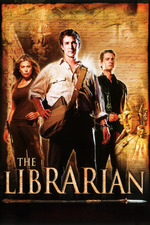 Quest for the Spear introduces Flynn Carsen (Noah Wyle), who is hired by the Metropolitan Public Library as a librarian. What Flynn does not realize is the library has existed for centuries and protects a range of historical and often magical items in a secret section of the library, including The Ark of the Covenant, Pandora's box, and Excalibur. When part of the Spear of Destiny is stolen from the library, Flynn must recover it with the help of Nicole Noone. TNT is re-running the 3 The Librarians specials today leading up to tonight's series launch, just want to get these posts up in case anyone gets sucked into the marathon and wants to discuss. I first encountered this series in the fanfare metatalk thread. I loved the concept of the series but I was pretty disappointed by the first movie. They had Jane Curtain, Bob Newhart, and Olympia Dukakis so they weren't lacking in acting talent but the movies seemed to lack wit or a sense of fun. The movies did get progressively better so I'm hoping that they'll figure out how to improve as they iterate through the series. The girlfriend per movie and the mom schticks really do have go though. I would love for this to come close to being as good as the excellent adventures of young Indiana Jones which is my standard for series inspired by Saturday morning serials. I think Noah Wyle is just going to be a recurring character in the series, not the focus, so the whole 'disposable Bond girl' aspect of the female leads in the specials shouldn't be an issue. Only had a chance to rewatch this first movie so far. It was better and worse than I remembered - Newhart and Curtin are the saving grace of the show, definitely. Wow, they're making a series of this? Huh. This is... not a good film by any stretch of the imagination. It's occasionally fun, but weirdly po-faced for a film in which the main character translates a language with no referents. And has 22 degrees. "The film closes when Nicole comes to Flynn, saying that the 'Death Scorpion Cult' has their hands on H. G. Wells' Time Machine (a real time machine, and not the novel) while Flynn comments on why these groups have insect names." I like the idea that in an alternate universe the Librarian films are about chasing down an evil cult who keep taking books out from the library, not returning them, then refusing to pay their overdue fees.